So last week I found myself wondering what to do with the giant bunch of cilantro that I bought at Jungle Jim’s for just $.60. I used some of a dinner I made last weekend. But didn’t want the rest to go to waste. I knew immediately that I wanted to make a pesto, and a spicy one…as I had about 30 jalapenos staring at my from the middle shelf of the fridge! 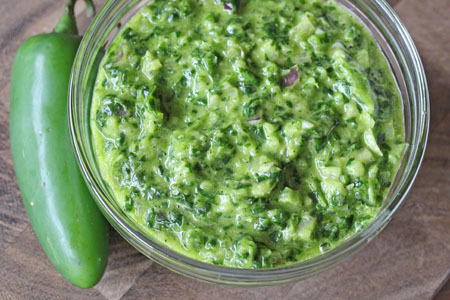 This pesto will be perfect to make when you can’t keep up with all the cilantro growing in your garden this summer! I remember this happening the last 2 years, but I didn’t think to make pesto with it then. Remove stems. As best you can! 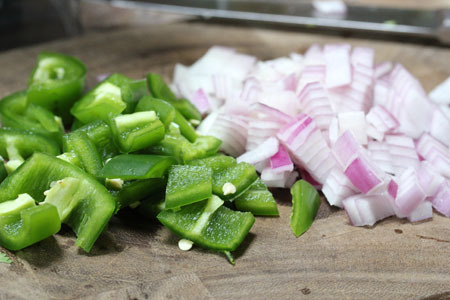 Chop jalapenos and red onion. 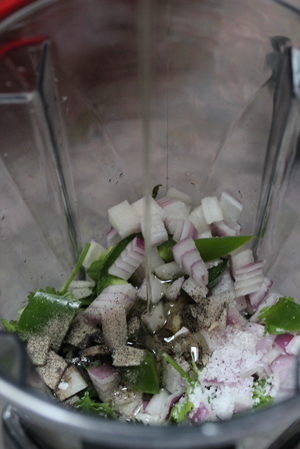 Add it all to the blender with salt and pepper. Stream in more if you need it. 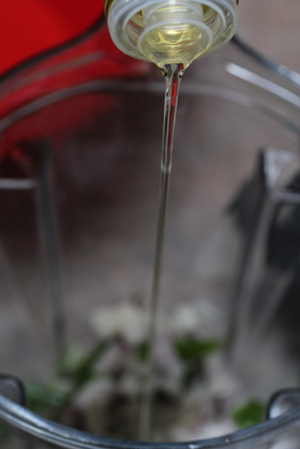 Use a masher to push it down as it blends, if necessary. Blend until smooth-ish. I’ve got grand plans to use it on grilled pizzas, paninis and sandwiches this summer. And yes, I’ll be making more with the second bunch that I got this past weekend at Jungle Jim’s. Then I should have enough to last all summer! 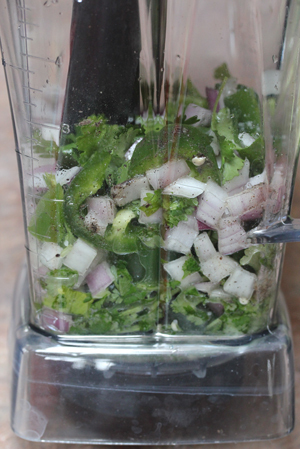 Remove the stems from the cilantro leaves and place them into a food processor or blender. 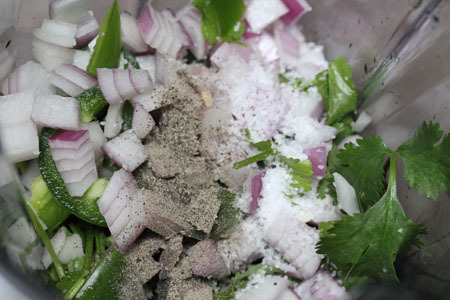 Add the jalapenos, chopped red onion, salt and pepper. Stream in about 3 Tbsp of olive oil. Blend and add more olive oil if necessary. Press the leaves into the base if necessary, to get the pesto to form. Store in airtight container in the fridge for up to a week. Or freeze in airtight containers or freezer baggies. Just leave a little room at the top, as it will expand some as it freezes. Makes about 2 cups of pesto. You had me at cilantro! YUMMYY!!!!! Definitely sounds interesting and cilantro is only $0.66 this week at Publix. 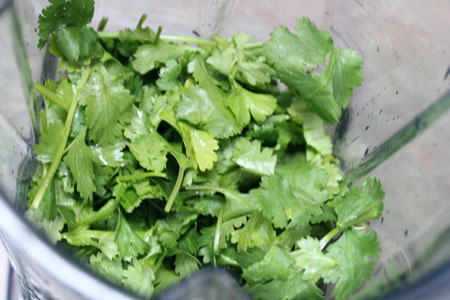 Very good ideas for using cilantro. We buy cilantro often and use with roasts, soups, casseroles and as garnish but had not considered a cilantro pesto. 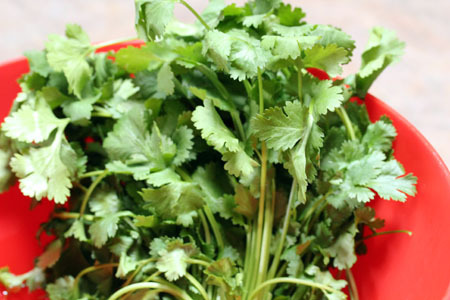 Cilantro enhances the taste of foods and has a nice fragrance. Like your idea about freezing portions to reuse later, a time saver. Very nice photos! i freeze all my pestos, pureed beans, and tomato paste in ice cube trays. pop them out when frozen and stored in containers or ziplocs then store in freezer. i’ll have to try this pesto. might add it to the salsa i made year round with canned rotel. calls for fresh cilantro i don’t always keep on hand. An answer from an expert! Thanks for cotnruibitng.